Last week in our commentary we mentioned the light calendar and the continuation of the robust inflow cycle into municipal mutual funds. That theme continued this week and should continue into April. We believe the recent strong performance in municipals will continue through the end of March. Municipal/treasury yield ratios are now at rich levels (10-year is 78% and 30-year is 92.4%). The new issue calendar is starting to build with next week’s total negotiated and competitive issuance coming in around $8-9bn. 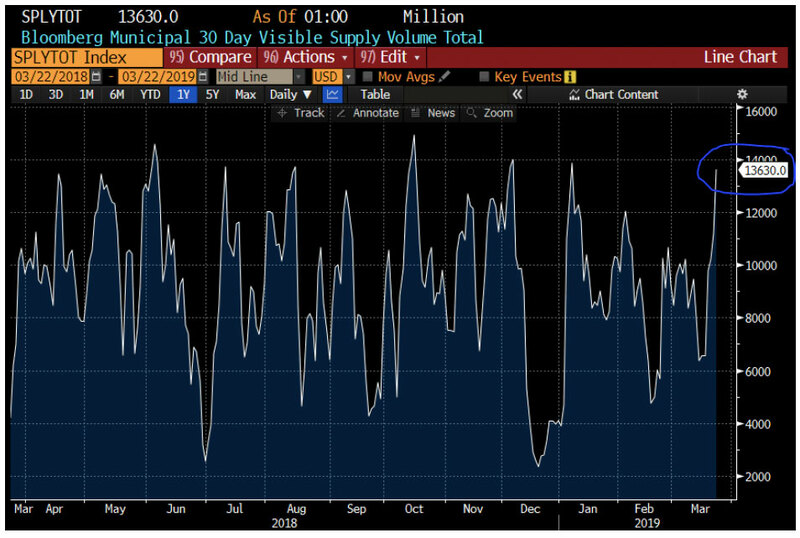 According to Bloomberg’s municipal 30-day visible supply index , municipal issuance is poised to be the highest since February 5th. 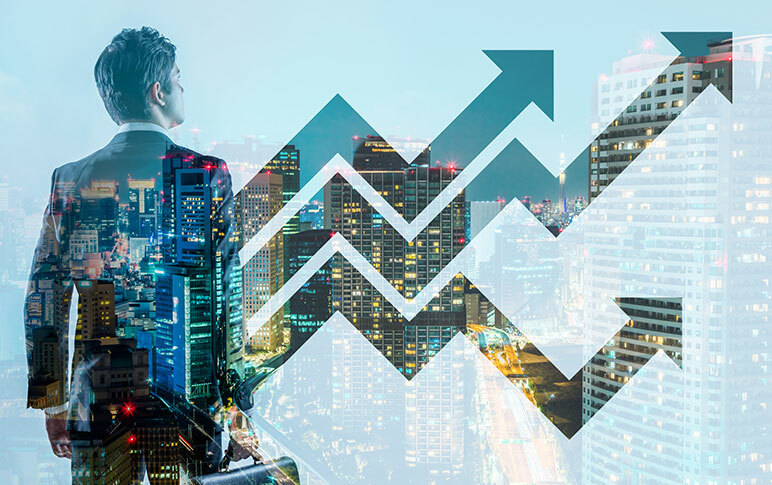 We believe that mid-April could be a better entry point for longer term trades, because in our view the calendar should build and fund inflows should subside going into and following “tax day,” providing a better entry point into the market. Lipper reported the 11th consecutive week of inflows this past week with total inflows of $1.4bn for the period ending March 20th. High yield funds recorded $480mn of inflows, intermediate funds $310mn, and long -term funds saw $1.1bn of inflows. Municipal ETF’s registered $169mn of inflows. 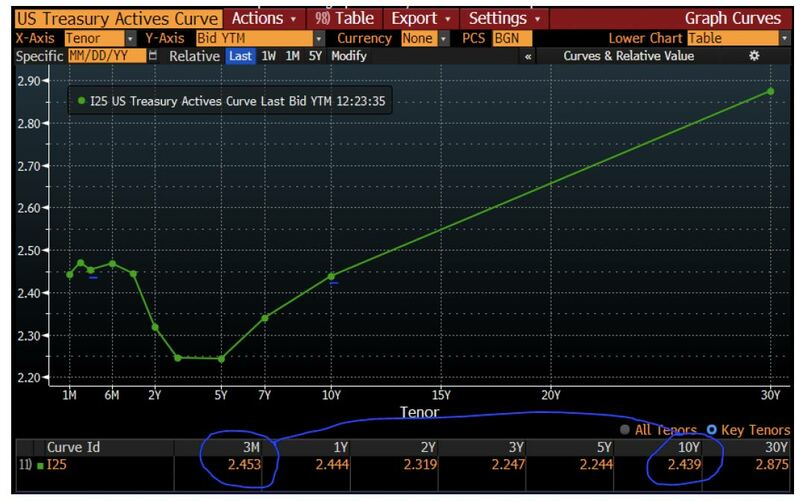 “The Curve” – *The Treasury 3-month to 10-year curve inverted Friday for the first time since 2007. The move occurred following weak manufacturing data from both the United States and Germany, sparking renewed worries about global growth and the ongoing trade talks with China. This move in the treasury yield curve is believed by many to be one of the most reliable recession indicators in the market. An inverted yield curve doesn’t necessarily mean a recession is imminent but that one is more likely over the next year or two.